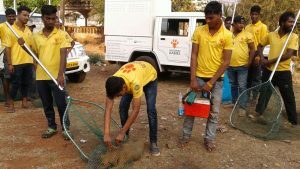 Mission Rabies, a charity set up by UK veterinarian, Dr Luke Gamble, to help to eliminate rabies has received a grant from the Rotary Foundation, a global organization based in the USA, to support its rabies-control projects in Goa, India. The grant was initiated by three Rotary Clubs in Gainesville, Florida, USA, in partnership with the Panaji Mid Town Rotary Club and four other Rotary Clubs in Goa. It will provide vehicles and driver salaries for Mission Rabies’ vaccination projects in the Indian state. To date, more than 187,554 dogs have already been vaccinated as part of this campaign which began in 2014 and aims to make Goa a rabies-free state. Gainesville Rotarian Professor Colin Burrows worked with colleagues to secure the grant. A past president of the World Small Animal Veterinary Association, Professor Burrows is also trustee of Mission Rabies USA. He said: “Globally, at least one child dies from rabies every nine minutes. Thousands of animals also die an agonizing death. The vast majority of human deaths are caused by bites from infected dogs and it has been shown that human cases can be significantly reduced by vaccinating the dogs, a much more cost-effective option than vaccinating people. The WSAVA’s charitable Foundation also continued its support of Mission Rabies during 2017, most recently through donating the proceeds of its ‘Fun(d) Run, organized during WSAVA World Congress in Copenhagen, to the charity. The WSAVA represents more than 200,000 veterinarians worldwide through its 105 member associations.